Make a Donation to AERE! In 2015, the AERE Board of Directors moved to recog­nize the many distinguished contributions of Wally Oates by naming the AERE Outstanding Doctoral Dissertation Award in his honor and initiating a fund-­raising drive to endow the award in perpetuity. Winners of the Oates Dissertation Award receive a handsome plaque, a $1,500 cash award, and $500 in travel support to attend the annual AERE Luncheon and Business Meeting held each January at the Allied Social Science Associations (ASSA) annual meeting to receive the award. AERE estimates that approximately $50,000 is needed to fully endow the award. Fundraising efforts have generated contributions and pledges of over $37,000 towards its $50,000 goal. Wally was a seminal figure in the modern field of envi­ronmental economics. His book The Theory of Environmental Policy, coauthored with William Baumol, is a classic in the field and was honored by AERE as a Publication of Enduring Quality in 1993. 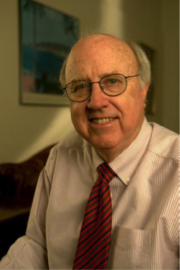 Wally was also an inaugural AERE Fellow and served on the AERE Board from 1983 – 1986. The Oates Memorial Fund supports the annual Wallace E. Oates Outstanding Doctoral Dissertation Award, given each year to the student whose dissertation exemplifies originality in research, quality of implementation, and whose research findings have intellectual and practical significance. Naming the dissertation award in Wally's honor is a fitting and enduring way to honor his memory. The AERE General Fund supports AERE's programming, including conferences, sponsored sessions at regional and national economics meetings, and research dissemination through two outstanding Association-owned journals that are produced in partnership with not-for-profit publishers. To donate to either fund by phone or by check, or for donation questions, please contact the AERE Membership Office.